Bashabi Fraser is a transnational writer, based in Scotland. She is a poet, a children's writer, editor and translator. Born in West Bengal, India, she has lived in London, Darjeeling, Kolkata and now Edinburgh, and she moves between east and west with ease. Much of her work involves diasporic themes: the intermeshings of culture and identity, of diaspora and dislocation, of memory and nostalgia; and of conflicts and freedoms. Her recent books include: From the Ganga to the Tay (an epic poem, 2009); Bengal Partition Stories: An Unclosed Chapter (2006, 2008); A Meeting of Two Minds: the Geddes Tagore Letters (2005); and Tartan & Turban (poems, 2004). 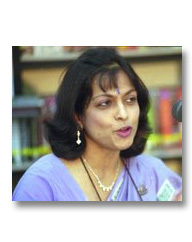 Bashabi has contributed to many journals, magazines and newspapers. Her poems have been widely anthologised and they have been translated into Bengali, Urdu and Hindi. Her academic teaching, writing and research focus on postcolonial theory and literature, and on literature of the Modern period. Currently she is working on a research project on the life stories of Scots in India. A PhD in English, Bashabi is a Lecturer in English and Creative Writing at Edinburgh Napier University and an Honorary Fellow at the University of Edinburgh.